The VEXO GH2006H Hand Arm Vibration Meter makes all the measurements required for a vibration risk assessment in line with the regulations. This fully featured meter has been designed to be very quick and easy to use. As it is not just a general vibration meter, but designed specifically for hand-arm vibration, there is no complicated setup or selection of measurement parameters. We also offer kits with equipment to measure both vibration and noise in the workplace. For more information please see our Combination Kits pages. The VEXO GA2006H is a hand-held meter for measuring the levels of vibration that can be transmitted to the hand from power tools and related machinery. It is fully compliant with ISO 8041:2005, the standard that specifies the performance and tolerance limits for instruments used to assess the human response to vibration. It is also the correct grade of meter for making measurements to ISO 5349:2001, the standard for the measurement and evaluation of human exposure to vibration transmitted to the hand. 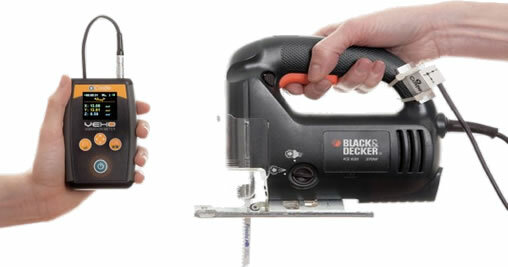 The VEXO is suitable for use with almost any hand-held or hand-controlled power tool that risks transmitting vibration to the operator's hand. The tri-axial transducer is mounted to the hand-grip using ties or jubilee style clips, so as long as there is a suitable mounting point the rest is easy. As a hand-held power tool usually has some form of hand-grip there should always be a suitable mounting point for the tri-axial accelerometer. The VEXO is not just a generic vibration meter, but was designed from scratch to measure hand-arm vibration. As a result it is much easier to use than our general purpose meters, with no risk of measuring the wrong parameters. The tri-axial transducer should be attached securely to the tool to ensure the vibrations are correctly transmitted to it. Instructions are included to show the correct method and orientation. The mounting block and attachments are included in the kit. Press the Run/Stop/OK key to start the measurement. During measurement the display shows the current vibration levels in real-time. The results from the vibration measurement can be viewed on the meter's display. 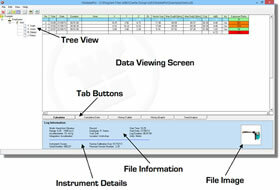 You can also download the measurements to the included software for further analysis, reporting and long-term storage. The VEXO Hand Arm Vibration Meter is supplied with the Vibdata Lite program, which can be used to download measurements and present vibration reports. Although software is not needed to operate the VEXO vibration meter - you can read the measurements from the meter's display - it is useful to download the measurements for further analysis and storage of your records as required by the regulations. Once downloaded, your vibration measurements can be displayed on-screen as shown above, with high vibration levels indicated in orange and red. The thresholds for these colours can be changed, but are usually aligned with the regulations. The VEXO Hand Arm Vibration Meter meets the strict standards that are required by the hand arm vibration regulations. 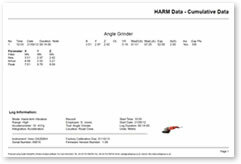 The ISO 8041 standard defines the required performance for a meter that measures the human response to vibration. The ISO 5349 standard defines the ways to measure and evaluate human exposure to hand-transmitted vibration.